November is shaping up to be a busy month for us! 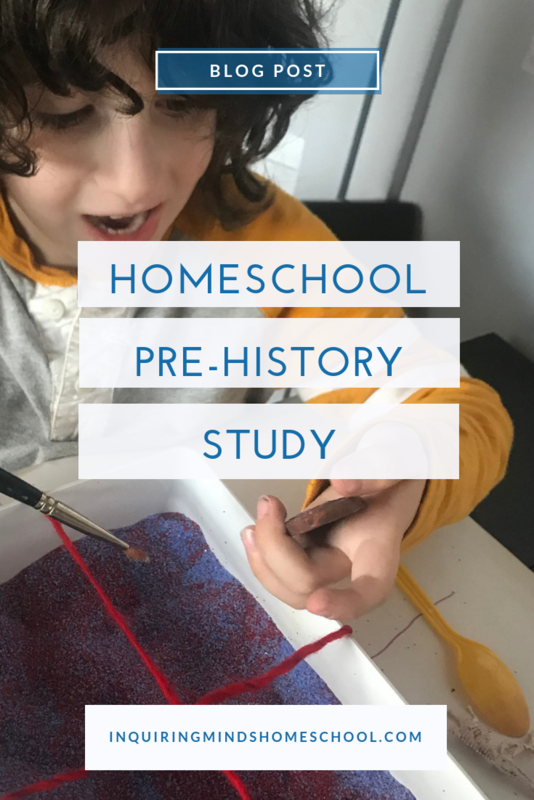 We started our very first history study in our homeschool – prehistory! 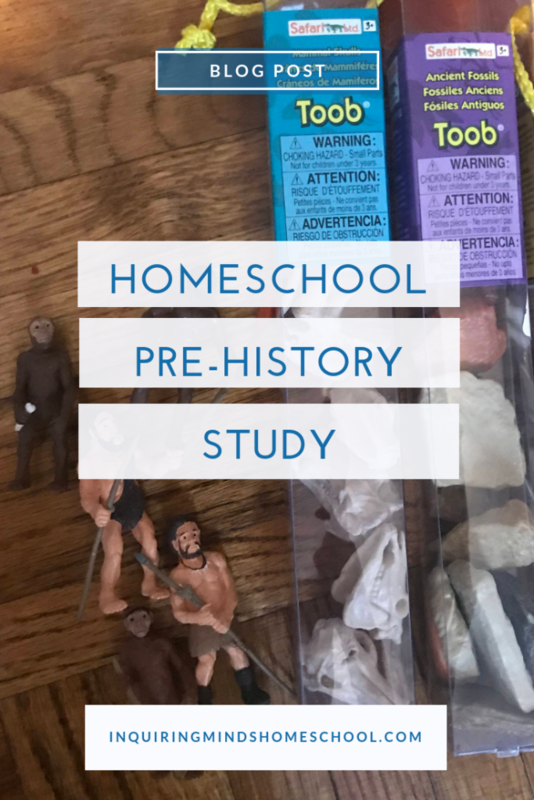 If you’d like some ideas about how to set up your own homeschool prehistory study, read on! We’ll get into some recommendations for books and projects, as well as ideas for further research. Disclosure: As an Amazon affiliate, I receive a small commission if you purchase a linked product from this post, at no additional cost to you. Thanks for supporting the site! 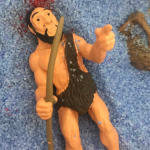 Why teach prehistory in your homeschool? Many homeschool history curricula start with the first civilizations, such as the Sumerians. This is fine, as far as it goes. We do have much more information about large civilizations, particularly those with systems of writing. However, starting here makes it seem like “nothing happened” before humans began to live in large numbers under warlike kings. And that just isn’t the case. On the other hand, starting “at the beginning” can mean different things to different people. For more on different possible starting points, I wrote a full post on the subject: Secular Homeschool History – Where to Start? Our starting point was a natural outgrowth of my son’s interest in dinosaurs and other extinct creatures from prehistoric times. I wanted him to understand that humans didn’t suddenly spring up, fully civilized, right after the dinosaurs went extinct. On the contrary, almost 65 million years passed, and the Earth wasn’t sitting empty all that time. So we started with the extinction of the dinosaurs, and what happened afterwards. For our homeschool prehistory study, it wasn’t necessary to delve into all the ins and outs of the various time periods after the dinosaurs went extinct. Instead, we used a book from our library to get an overview. This book seems to be out of print, but our local library has it, and Amazon does as well. Prehistoric: After the Dinosaurs features a variety of animals that my son enjoyed reading about. His favorite may have been the terror birds, or possibly the giant ground sloths. I enjoyed this approach because it sets the stage for the evolution of humans, bringing up obstacles to survival like changes in climate, large scary predators, and competition for food. I thought this would make sense because the same techniques that enable scientists to learn about the dinosaurs, terror birds, or ground sloths also make it possible to learn about the evolution of humans. 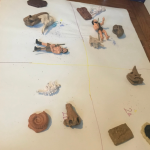 So my son and I became archaeologists. Technically, paleontologists study fossils, and archaeologists study human artifacts, structures, and remains. However, in practice, these scientists use many of the same techniques. Also, when we get to the fossils and artifacts left behind by early hominids, we’re at the boundary line between the two disciplines. So, after a brief discussion about this with my child, we dove in. We started by reading the book Archaeologists Dig for Clues. This was a fairly quick read that explained what archaeology is and how it is practiced. The book immediately makes clear that archaeology is not treasure hunting and doesn’t involve any Indiana Jones hijinks. In fact, scientists leave artifacts exactly where they’re found so the site can be mapped, photographed, and sketched. When objects ARE removed, they’re labeled very carefully. 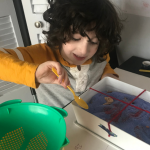 After the story, my son became an archaeologist/paleontologist and worked on a dig site that I set up for him. I plan on writing more about exactly how I did this in a separate post. 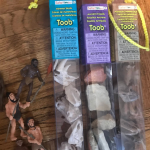 Dig items included the contents of several Safari Toobs: Ancient Fossils, Prehistoric Mammal Skulls, and Human Evolution, plus a few from our dinosaur collection. 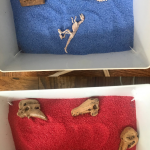 A few bags of sand from the Dollar Store completed the dig! I plan to write a separate post about our visit to the museum, since it’s got so many resources for studying prehistory. We’ll go back for the cultural halls on another occasion, including the reconstruction of the Lord of Sipan archaeological site. On this visit, we went to the Hall of Human Origins as our primary stop. Here’s the movie from that hall on human evolution, which is great to watch at home if you aren’t in NYC and can’t physically visit. After focusing on prehistory, we then turned to history – the dawn of modern humans. 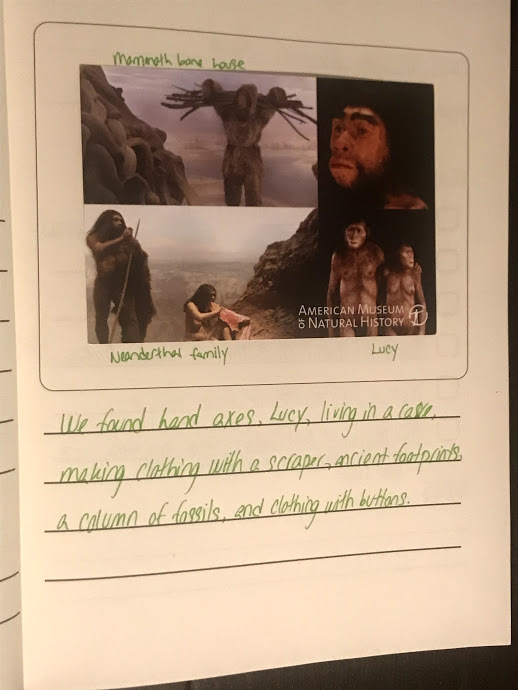 We used a few key resources for this, namely Story of the World‘s opening chapters, the Usborne Encyclopedia of World History, and A Child Through Time. We plan to do much more with all three of these books as our study progresses. One resource that we haven’t delved into yet, but will, is the Ancient Civilizations History Pockets book. 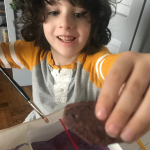 My son is excited about making the puppets, and the timeline will be helpful as well. It doesn’t cover any prehistory, so I put it aside until we were ready. 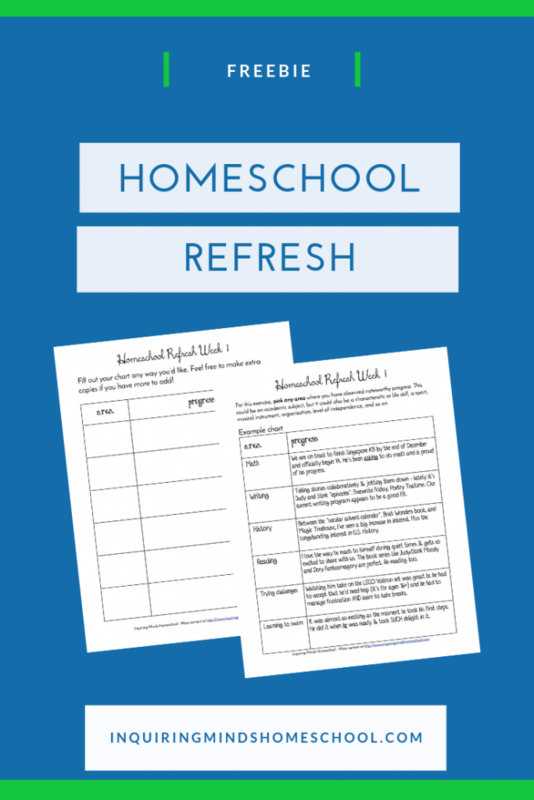 As homeschoolers, we have so much flexibility – we can use whatever resources work best for us. Many of the resources that I’ve used so far have come from the History Odyssey curriculum from Pandia Press. Several are books that I researched on my own. History Odyssey doesn’t cover prehistory at all, other than to recommend the Usborne Encyclopedia of World History, which includes all geologic time. A major theme of our history study is going to be how humans have communicated ideas over time. We’ll mostly be studying forms of writing (cuneiform, hieroglyphs, etc.) but I’d be remiss if I had not included cave paintings! 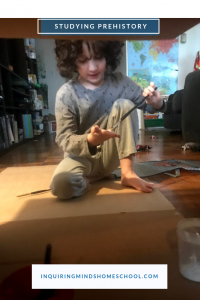 We got a big cardboard box and some natural-looking paint colors, and my son had a blast painting hand prints, dots, and lines on the inside. We then decorated the outside together. Here are a few photos – it was hard to get good shots. 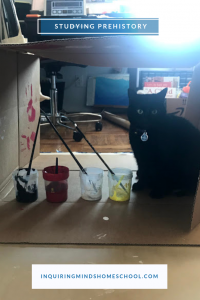 The 2nd one is our cat Charlotte, who loves boxes! One final addition to our routine that has made a huge difference: organizing my son using a learning journal. This is an idea I’ve been wanting to implement for a while, but I was searching around for a good product to buy. When I didn’t find one to my liking, I made one! 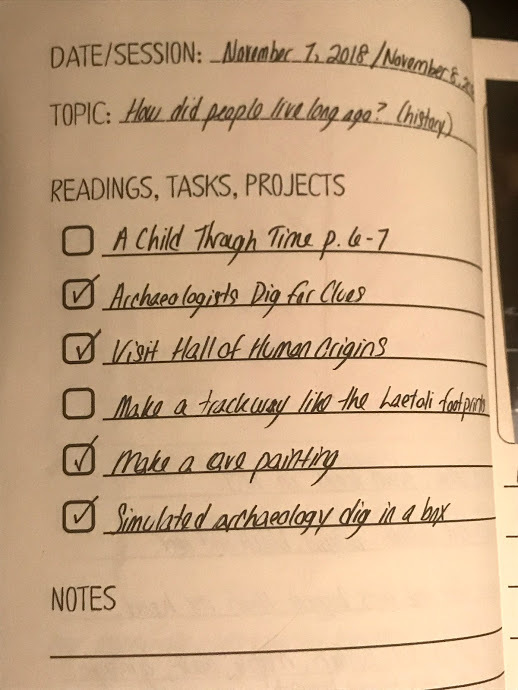 It’s still in beta – we’re testing it out to see what we like and don’t like – but I highly recommend making a checklist for yourself and your child to share, whether you purchase a book or make your own on your computer. The format I designed has room on one side for me to write the projects and books we’re going to do, and on the other side a space for my son to draw and write a caption. This is the “collaborative edition” of the book, since I plan to make one for when he’s able to work independently. 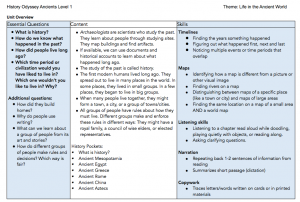 So there you have it – our homeschool prehistory study! If you’d like to know more about my approach to history in general, check out this post. 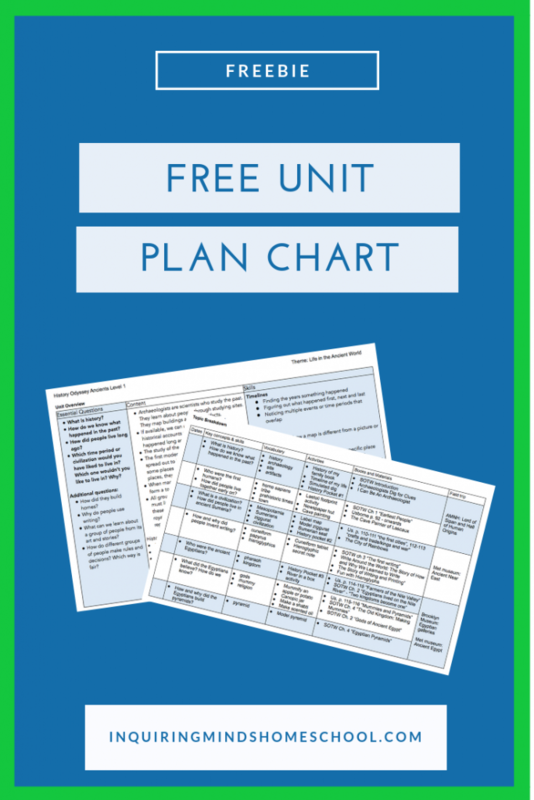 Or if you’d like my free history planner, check it out here!